Bridlington Priory was founded in 1113 by Walter de Gant for Augustinian Canons Regular. It is one of the earliest such houses in England. The Priory 900 logo is based on a pilgrim’s cap badge which was found in the mud of the Thames in London. This modern day pilgrimage was part of the Priory 900th Anniversary Celebrations which continued throughout much of 2013. In fact, there were two pilgrimage events in late August, culminating at the Priory on 28th August, the feast day of St Augustine of Hippo. 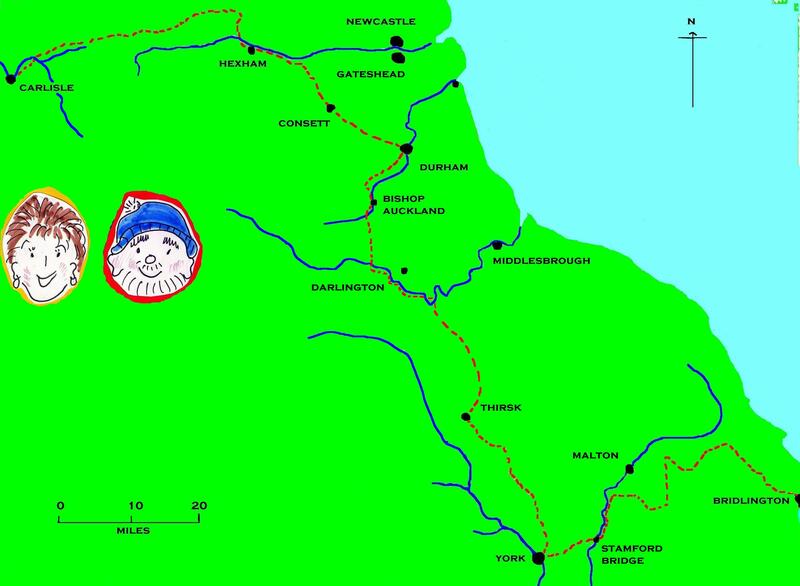 One was from Beverley to Bridlington. The other started at York on 22nd August 2013. Starting from Carlisle Cathedral (Augustinian) with a blessing for the journey, we walked along the route of Hadrian’s Wall through Lanercost to Hexham arriving there to take part in their worship on Sunday 4th August. Then we followed footpaths and rail trails to Durham, visited the Cathedral and headed south to cross the River Tees at Piercebridge. We walked through the Yorkshire countryside to Osmotherley, Thirsk, Easingwold and then began the main pilgrimage (with others) from York to Bridlington Priory. As this was a pilgrimage, we visited as many churches as we could en route and joined local worshippers or prayed in the churches. Details of how we got on are on the blog with maps and photos showing our progress. All donations made on our Pilgrimage Walk from Carlisle to Bridlington will be given towards a Christian Aid partnership project in Afghanistan. Christian Aid and our local partner the Afghan Women’s Educational Centre (AWEC) are embarking on a three year program to help over 1,000 women and young people speak out for change in their country – through adult education, literacy training and participation in local and national decision making.